Discussion in 'General Chatter' started by Chris77, Oct 3, 2008. 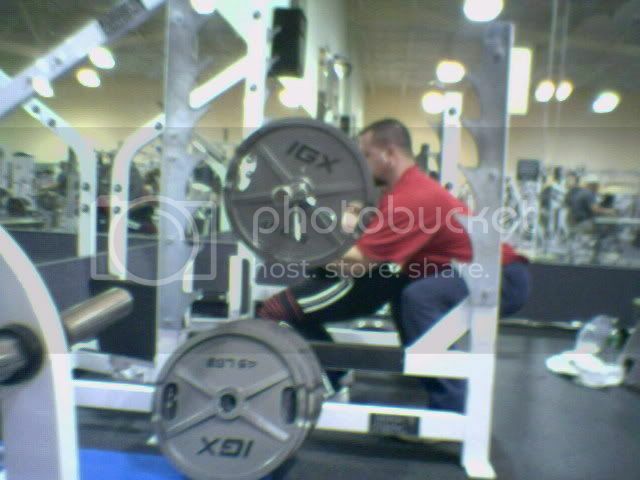 This is me when I used to competitively powerlift 5 years ago. I sprained my back while training for the NY State Championships and had to quite powerlifting or risk permanent back injury. I don't look like this anymore, unfortunately. I'm fat now But I'm happy and that's all that matters. Although, I was happy doing what I was doing it took ALOT of dedication and I was basically ate, slept and breathed the gym and had I continued, I wouldn't have done half the living I have, and would in all likelihood not be married right now as my obsession was putting quite a strain on me and DH (who was my boyfriend at the time) So, I do miss what I was able to do (if I tried to do it now I'd collapse to the floor and never get back up) but I think what I have gained in its place has been most remarkable. I miss the bond my brother and I had while I was training as since my 'retirement' from the sport, my brother and I aren't half as close as we used to be. Okay, I'm sorry, going off on a HUGE tagent here. I was just feeling a bit bad about myself earlier and came across these pictures (which didn't help as I wanted to cry b/c I'm a good 50 pounds heavier now but it also helped me if you know what I mean) Ok, so without further ado....my pictures..